And I still don’t get how it happened, but one day I dusted off the abandoned yoga mat, rolled it out on the floor, and tried Yoga with Adriene. Needless to say, Adriene and I are best buds now. She and I hang out every morning at around 7:30am. I’m still in my pj’s, my hair’s a mess, my face still has indentations from the trauma created by drool and sheets, and there’s definitely no mascara on my eyelashes. And Adriene never says a thing. She doesn’t scowl or make a face at my appearance. Quite the contrary. Her face is all smiles as she shows me how to flow from one pose to the next, always breathing, always exploring my body, my self. She’s just so loving and gets me to put my focus right where it belongs. Inside. I’m breathing, checking in with “what feels good,” relishing in gratitude, and not even thinking about all the competitive junk that has always run through my mind during an exercise class. 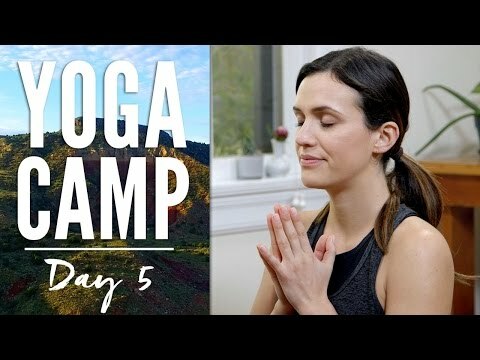 Adriene has posted a new series, Yoga Camp. I get to go to camp in the mountains with a Yogi right in my own living room! How cool is that!? For 30 minutes, the mantra I’m Alive filled my consciousness. Even now, as I write these words, I feel so much more vibrant and excited to be, thank G-d, in good health and capable of doing yoga. Today I realized that Adriene and I have been morning companions for almost three months now. And it all just started with the seed planted by a friend. This seed has now created some sort of a monster because after weeks of passing by my contorted self on his way out to synagogue, my very athletic, but pretty inflexible, husband is now doing yoga daily as well. It’s been a tremendously tangible lesson on the power of influence that we have on each other. Which makes me really grateful for the amazingly beautiful people I have in my life and how important it is to surround myself with them as much as possible. They have such wisdom to teach me! I bless all of us that we may cleave to those who inspire us to grow and stretch and strive towards our most radiant selves.